Justice Minister Ayelet Shaked (Jewish Home), too, deserves justice, Jewish Home MKs stated Monday, after a professor at Hebrew University of Jerusalem (HUJI) called her a "neo-Nazi." "This is the most severe incitement against the justice minister since the establishment of the state," Jewish Home chairman and Education Minister Naftali Bennett stated Monday night. ''I spoke with the University President, Menachem Ben-Sasson, and demanded he eradicate this phenomenon from the root." "Lecturers cannot be inciters - period." 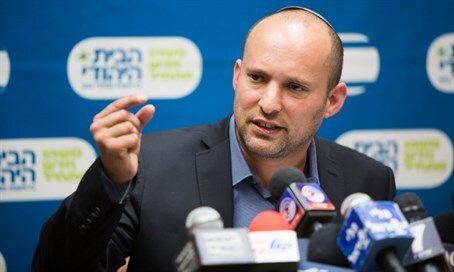 Bennett said that he intends to deviate from procedure, as he put it, and not rush to blame the Left for incitement. ''I'm not going to point fingers at anyone from the Left; only at ourselves," he said. "We are all to blame for the lecturer's incitement," he added, explaining that it is the entire State of Israel's responsibility to "weed out" inciters. MK Moti Yogev asked HUJI to let the professor go. "Dr. Ofer Cassif of Hebrew University has reportedly compared Prime Minister Binyamin Netanyahu to [Adolf] Hitler," Yogev noted. "Apart from filing a police report against his dirty mouth and miserable and inciting expression, HUJI ought to disavow his remarks, rebuke him, or even dismiss him. We will continue to build a strong Jewish and democratic state." MK Shuli Muallem-Refaeli stated in a special Arutz Sheva interview Monday night that "incitement of radical leftists against rightists and against Minister of Justice has risen this morning in another despicable move from HUJI professors." The MK further accused "enlightened professors and academics" of "just asking foreign countries to interfere in the policies of the Israeli government" and reacting to Shaked's Transparency Law to reduce that phenomenon poorly. "Instead of dealing with the matter at hand, to uncover the sources of funding in Israel, they shed the blood of the Minister of Justice," Muallem-Refaeli fired. "There is no other way to describe it except wild incitement."